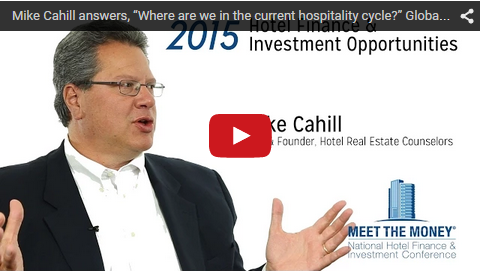 Mike Cahill, CEO and Founder of Hospitality Real Estate Counselors and co-chairman of the Lodging Industry Investment Council, speaks in the video below about activity in the 2015 hospitality market, the current cycle and where we may be headed next, distressed hotel sales from lenders, and interest rates and other potential disruptors to the hotel industry. 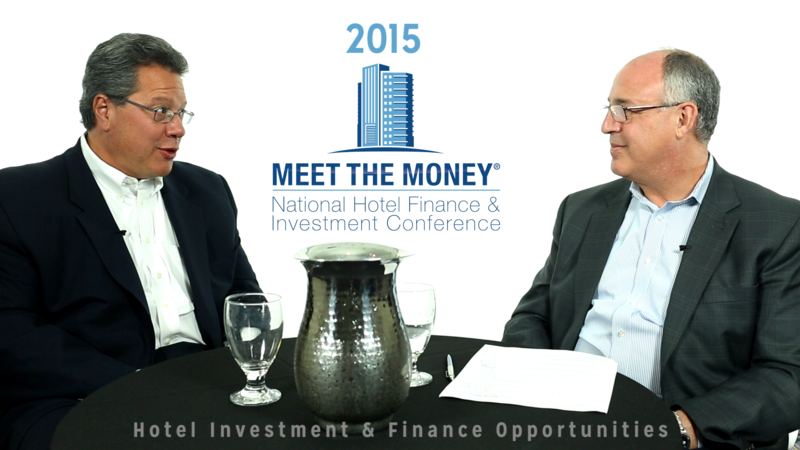 Mike’s conversation with Bob Braun, a senior partner in the JMBM Global Hospitality Group®, is part of our video interview series on hotel finance and investment opportunities in 2015. Bob Braun: Hi, I’m Bob Braun. I am a Partner with Jeffer Mangels Butler & Mitchell, and I am here at Meet the Money® 2015, our 25th anniversary, and I am sitting with Mike Cahill, CEO and founder of HREC. Mike, thanks very much for coming and spending a little time with us. Mike Cahill: Thank you for having us. Bob Braun: So I guess the first thing I was wondering is, from your position, what kind of opportunities do you see in the market and what are you doing to take advantage of those? Mike Cahill: I think it’s a very rare opportunity. It began last year. The theme of Meet the Money® this year is the windows are wide open and it’s beautiful outside. I think of all of the past cycles I have experienced, this is probably the biggest expansion of time where everything makes sense, where you look and see the really smart hotel guys—not only are they buying, they’re selling, they are converting over to building, and many are refi-ing. So it’s been really that rare window where everything makes sense, and I see people making more strategy moves. What’s strategic to their portfolio? What’s strategic to the mission of their company? What’s the exit strategy of what they are trying to aggregate through purchases? Or, what are they trying to accomplish through dispositions? Bob Braun: And it’s interesting because I think we have seen cases where people are both buying and selling. But, people are evolving. So what’s driving that? Bob Braun: Always quit winners. Mike Cahill: Yes. So it’s really a diversified group. The one thing that is missing from this cycle is really is those distressed hotels sales from lenders. And that’s never been there. So what you are seeing are the normal players that are in that window buying and selling, and not necessarily the mass sales by the lenders that we all anticipated in ‘07 and ‘08. Bob Braun: Now do you think that extended hold/retention by the lenders, their willingness to give a lot of room to the borrowers—do you think that those are ever going to come to market as distressed? Do you think the market is going to be forgiving and let those properties make their way back? Mike Cahill: So things have changed fundamentally. I think it’s education. I think in this cycle people don’t realize, when they take a step back and look at something like STR data. There is a clarity that wasn’t there before. If you remember back in the 80’s and 90’s, you would actually send out your consultants to interview the night auditor to try and guess what the occupancy rate was of the hotel. The consultant would aggregate it, and you’d have to guess. The flow of information is so much quicker and better today that I think people are making better decisions. Bob Braun: Now you mention the cycle—and it comes up every time when two or more hotel people get together—where are we in the cycle? Where do you think we are? Mike Cahill: It is interesting. Along with Jim Butler and Jeffer Mangels and Butler, I am co-chairman with the group called the Lodging Industry Investment Counsel, and every year we do a survey, and the survey is revealed at Meet the Money®—later this afternoon I’m about to reveal the survey. And we always get into the cycle question with the innings of the baseball game. It’s interesting because the last two years —for the first time it’s ever happened in the decade plus of the survey—it’s almost been like the groundhog day movie. The consensus was we were in this fifth and sixth inning, and we weren’t moving. And the most comparable year to the past cycle was 2006. And it’s interesting in this year’s survey we are finally seeing the movement and the movement from the fifth and sixth cycle to the sixth and seventh, with hope for extra innings. So, I don’t know whether it’s human nature, whether you know we have certain people—there was a Jeopardy question about it— someone is too happy, and they are afraid to be too happy, because something bad is going to happen. You often wonder if that is happening right now, that people are just so happy and things have been so good, that they’re making themselves scared and that’s causing the movement. Because when you dig into the details of the statistics, the statistics don’t support things are getting worse, but you just don’t know why there is that movement. Bob Braun: Yeah, it’s hard to say. I mean, talking to people, the demand appears to be continuing to pick up, if not tremendously, at least incrementally, and there isn’t a lot of new supply coming on board, and that’s always been the issue for me—supply is outreaching the demand, that’s when that cycle turns, and it doesn’t appear to be happening quite yet. Mike Cahill: And the interesting part if you look at STR statistics is that normally at this point in the cycle, what you’re going to see is a very sharp evolution in revPAR, and what you are looking for is lower occupancy growth and more demand growth, which shows that people are not using your product more, but things are good enough that you are able to charge more for them. And it’s interesting that we’re still seeing occupancy growth, and we’re setting records, even with their B&B and other disruptors, and we are seeing the ADR growth, and we’re having revPAR growth between 5 to 10 percent this far into the cycle. These are very strong underlying fundamentals that I would say exceed ‘07 and are much better than even ‘06. Bob Braun: And so that would lead to the next question, because you mentioned disruptors. So what kind of thing is going to ruin the party? What’s going to rain on our parade? Mike Cahill: In the LIIC survey that we are unveiling today, the people who are members of LIIC—these are guys who control 40 billion dollars’ worth of hotel real estate, direct disposition-acquisition control; and these guys have actually 60% have bought a hotel in the last six months; 50% have hotels under contract—and I asked them, “What is worrying you? What is the greatest threat?” and we put this massive list together. The number one threat that they are fearing is rising interest rates, an effect on going in at these cap rates, and interest rates having a ripple effect on the going-out cap rates or a cost of debt on their exit. Number two, in terms of their fear, was strength of the U.S. dollar, and when you read into it, it might be that these big wigs are heavily invested in the coastal markets and not in Des Moines and St. Louis’s, so it may be skewed a little bit. And the other threat was government-mandated minimum wage increases. And when you break that down, what was surprising about it was new supply wasn’t in the top three. Mike Cahill: And it’s really the feedback that we are getting from people is that the new supply issue is really relative to the specific market areas and not a macro, and it’s a macro question. Because we also asked them—you know I tried to get to the answer in a different way—and I said, “Okay for those of you, you 60% rich hotel Illuminati that have purchased hotels in the last twelve months, “Have you ever not purchased a hotel specifically because you are concerned about new supply?” Fifty percent said “Yes.” So you have a little survey issue here in terms of the question, so. Bob Braun: …And so when the interest rates do rise—and I don’t think anybody expects to see huge increases in interest rates, more like incremental changes—whether that’s really going to have the same impact that people expected to have. So it’s an interesting issue. Let me ask you, is there one particular thing that you would like to leave us with, one sort of parting note that you’d like people to remember this conversation by? Mike Cahill: Yeah, I think in terms of this moment and in term of the next twelve months I would say “Enjoy it. Be happy.” The topic for the LIIC survey this year is “Carpe diem. Hotel investors bask in the rare and glorious sunshine.” Try not to be the people that say “Hey, times are too good. Something bad is going to happen.” I think if something does disrupt the cycle, it will be a macro event. It will be a terrorism event, God forbid, or something in the Middle East that causes a disruptor. Because if you really look at it, the fundamentals are there, and—who knows?— this may be the rarest, longest real estate cycle that we all have had, and maybe a lot of guys in business who have been looking for this amount of time to make some money to finally retire, as opposed to we’re all going to keep going until we’re 90 years old doing the same thing. Maybe this is one of those windows where it just is a good time. I heard some economist talking about in the panel earlier today at Meet the Money®, maybe a soft session in 2017 but, maybe it’s something that doesn’t fundamentally disrupt or stop the industry because it wasn’t long ago, if you look back to 2009, where it stopped. The average hotel dropped in value 50% in twelve months. Bob Braun: I remember that. Mike Cahill: And transaction volume went down 95%, and basically the world stopped. But for now things are good, so seize the day, buy a hotel, sell a hotel. From the lodging industry investment counsel survey, 60% have also included building hotels in their portfolio. Bob Braun: That’s great news. It’s very important to always say try to enjoy it while we can. Bob Braun: Mike, I really appreciate it. Thanks very much for taking the time. Mike Cahill: I enjoyed the opportunity. Bob Braun: Thanks a lot. Okay.